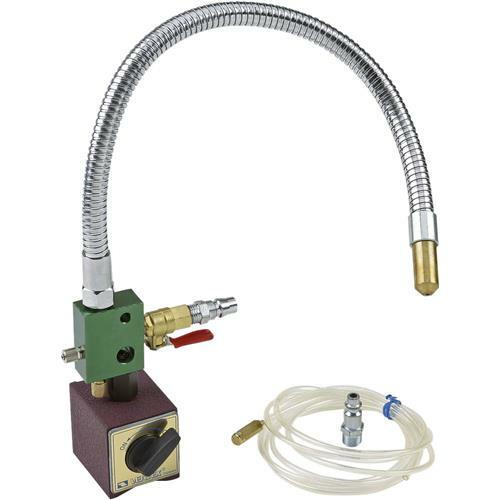 This magnetic mist coolant dispenser is excellent for knife making and other cooling operations where flood coolant systems are not practical. Air intake has a quick release coupling pre-attached with a cutoff valve. Comes with a coolant hose with a filter head that you can simply drop into a bucket of water. Small adjustment knob allows you to adjust the amount of spray easily. Powerful magnetic base attaches to any steel surface and heavy-duty flexible metal nozzle can be positioned quickly and exactly where you want it. This a heavy duty flexible hose mist coolant dispenser that will you years of trouble-free use.